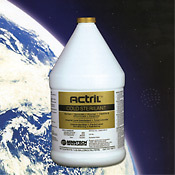 Actril® Cold Sterilant is a stabilized mixture of peracetic acid, hydrogen peroxide and acetic acid. Because it is formaldehyde-free and glutaraldehyde free, Actril Cold Sterilant allows you to practice effective, state of the art disinfection, safeguarding your patients and staff. Actril Cold Sterilant's formulation contains no phenols or chloride compounds - an additional benefit to staff and patients. The stabilized mixture of peracetic acid, hydrogen peroxide and acetic acid leaves no toxic residues. After reacting with organic material, Actril Cold Sterilant decomposes into oxygen and acetic acid. In addition it is biodegradable in waste water streams. Actril Cold Sterilant completely destroys all microorganisms, including viruses, bacteria, spores, and fungi. It is effective against Pseudomonas aeruginosa, Bacillus subtilis, non-tuberculous Mycobacteria (NTM), hepatitis B virus, and HIV (the virus associated with AIDS). Full strength, Actril Cold Sterilant has proven to be effective at 5.5 hours contact time when used in the sporicidal test of the American Organization of Analytical Chemists(AOAC), the test accepted by the Environmental Protection Agency to validate a chemical as a sterilant. Always consult the kidney dialysis machine manufacturer's "Directions for Use" when using sterilants in a kidney machine. 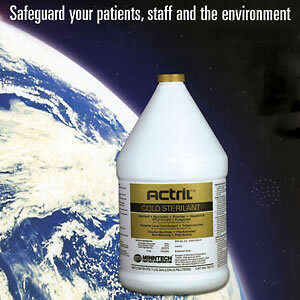 As a surface disinfectant, Actril Cold Sterilant diluted 35X provided hospital level disinfection in ten minutes. The Actril Residual Test Strip confirms that Actril Cold Sterilant concentrations have been reduced to safe levels during rinse procedures. 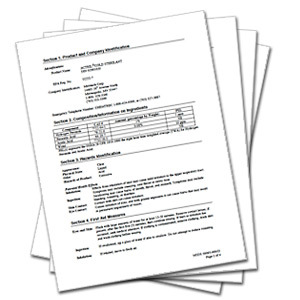 there is no need for time-consuming test procedures or the hassle of sending sample to outside laboratories. The Actril Indicator Test Strips indicates the presence of Actril Cold Sterilant within minutes.